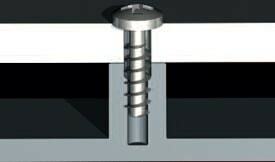 The Tappex TPX thread forming screws (not thread cutting) are designed to be used in most thermoplastic materials. These screws can be installed into drilled or moulded holes in a wide variety of applications. Tappex TPX screws are produced by cold forging, not machined from bar or wire and therefore have good inherent mechanical properties with minimum residual stress. Typically the workpiece material or substrate will relax as the screw rotates during installation and then shrink back, a little. For advice, please contact our Applications Engineering Department with your specific requirements. The part number is prefixed 069 followed by diameter and length, subsequent coding relates to type, material, finish etc. Please discuss your requirements with us. Refer to Tappex for availability and advice, ETP45® for further details of dimensions, hole design recommendations and features – see downloads. 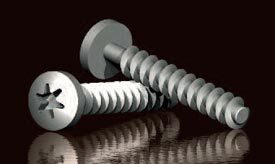 The following are downloads relating to the Thread forming screws range, although a downloads may also be applicable to other product ranges. General information can be found on our downloads page. If you can’t find what you are looking for, why not simply give us a ring on +44 (0) 1789 206600. Features, Design Considerations, Hole Design Features and Dimensions.